"Who: The D-Day Squadron was created by the non-profit, Tunison Foundation to coordinate and fundraise for the return of 20+ C-47’s/DC-3’s to Normandy, France in 2019 for the 75th Anniversary of D-Day. 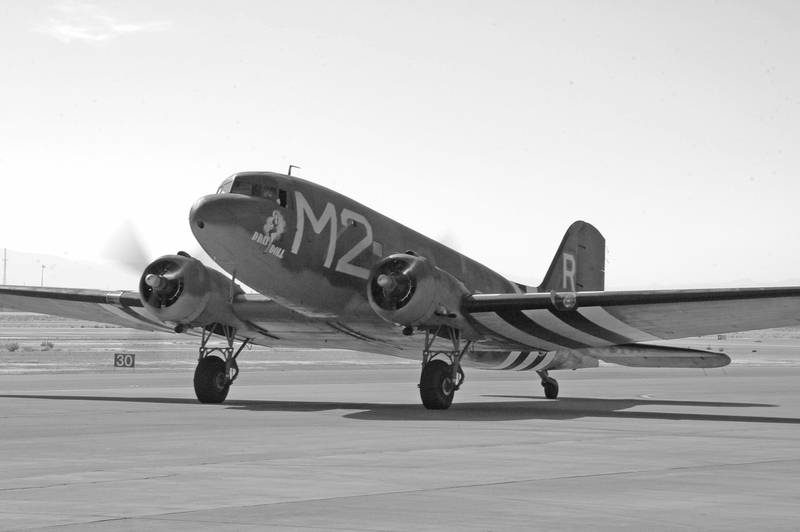 The Tunison Foundation owns the WWII D-Day/Market Garden Veteran C-47 “Placid Lassie,” and has experienced the trans-Atlantic crossing and particpated in the 70th D-Day Anniversary. What: Organize logistical support and fund raise for 20+ aircraft to participate in the 75th Anniversary events being organized by the Daks Over Normandy organization. Daks is the European non-profit organization who is planning celebrations in Duxford, England and Normandy, France. When: The European events take place from June 2nd through 9th. The D-Day Squadron aircraft will assemble in late May in Connecticut for kick-off events and media coverage. Where: The aircraft of the D-Day Squadron will assemble on the East Coast of the United States for a kick-off celebration and flight around the Statue of Liberty. They will then proceed over a route that will take them via Canada, Newfoundland, Greenland, Iceland and into Scotland and England for the start of events in Duxford, England from June 2nd through the 5th. They will them assemble with their European aircraft siblings and form the largest channel crossing of C-47’s/DC-3’s since 1944! They will end in Caen, France and participate in planned events and flights, culminating in the largest paratroop drop in Normandy since 1944! Why: Honor our WWII Veterans and their brothers-in-arms who gave their lives for liberty and democracy in a foreign land. This will most likely be the last anniversary of D-Day that WWII Veterans will be able to attend in person and witness via news and television broadcasts. Operation Overlord was one of the most pivotal points in WWII and was the beginning of the end of Nazi occupied Europe. Funds raised will be used judiciously used to safely transport the American fleet of C-47s to the Daks Over Normandy event in June 2019, and help make preparations for an ongoing educational outreach program honoring the civilian soldiers who’s bravery helped end a world war. The D-Day Squadron has already set-up the framework for the endeavor and is beginning to work with suppliers, supporters and sponsors to make this monumental journey. Fundraising has started, and we are coordinating direct mail and crowdsourced social media fundraising campaigns, along with engaging corporate sponsors for logistical support and sponsorship. How will the Atlantic Crossing Work? The D-Day Squadron, made up of the entire American fleet of C-47s participating the in Daks Over Normandy flyover, will depart and travel together on what’s known as a Blue Spruce Route. This flight plan traverses the North Atlantic, allowing for fuel stops and guidance from ground-based navigational aids on the landmasses located along the route. Each site was selected because of its history as an active airfield during World War II that would have been a stopping point for these historic aircraft. The Squadron will depart from Oxford, Connecticut (KOXC); stop to refuel in Goose Bay Airport (CYYR) in Newfoundland, Canada; refuel at Narsarsuaq Airport (BGBW) in southern Greenland; refuel at Reykjavik Airport (BIRK) in Iceland; and refuel a final time at Prestwick Airport (EPIK) on the Western coast of Scotland. The fleet will then make the next leg of this epic trip with a jaunt to Duxford Airfield (EGSU) north of London where they will position themselves with the entire international C-47 fleet for the final leg to Caen-Carpiquet Airport (LFRK) in Normandy, France as part of the Daks Over Normandy event on June 6, 2019. Warbird aircraft – flown in World War II at home or abroad – are meticulously maintained by a ground crew of certified aircraft mechanics that follow strict FAA standards. Pilots in command must also have a specialty type-rating to fly these vintage aircraft. They are safely operated and flown on a regular basis for pleasure, sport, entertainment and remembrance all around the world. 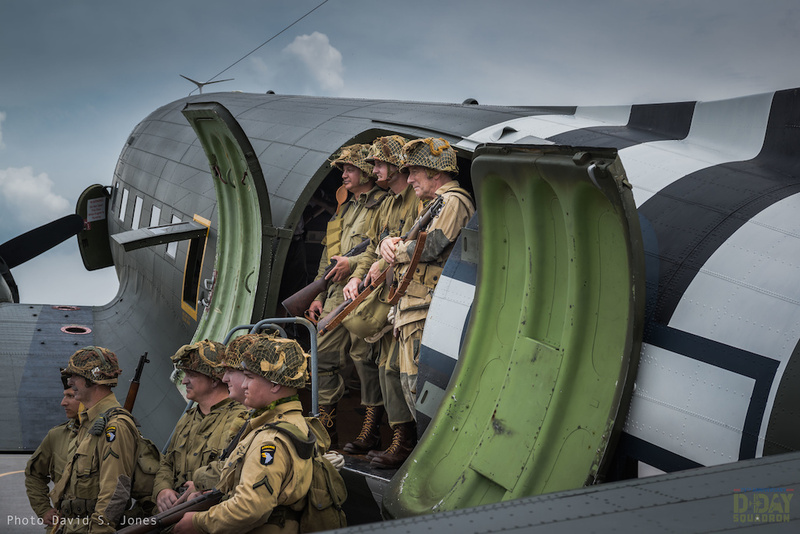 Join the D-Day Squadron to ensure their safe passage, secure necessary survival equipment and purchase the fuel that will get the aircraft and their crews to this extraordinary historic event. The D-Day Squadron is the American contingent participating in the Daks Over Normandy flyover crossing the English Channel to commemorate the 75th anniversary of D-Day on June 6, 2019. The skies will be filled with dozens of meticulously restored C-47 aircraft and hundreds of paratroopers billowing through the sky in authentic Allied uniforms and World War II military-style parachutes. Daks Over Normandy will be the largest assembly of these authentic War aircraft and paratroopers since that fateful day on June 6, 1944, all to honor the service and sacrifice of the citizen soldiers who risked life and limb to bring about the beginning of the end of the War in Europe. Aircraft from around the globe will participate in events both before and after the June 6 flyover, with community events and static displays in the United Kingdom and France for the education and enjoyment of the public. Volunteers of the D-Day Squadron will make an epic journey across the ocean with a fleet of American C-47s to help fill the skies once again with the sight of freedom. The citizen soldiers and aircraft that helped bring about an end to World War II will be honored in this historic tribute. Facts About the C-47 The iconic aircraft that dropped thousands of paratroopers into darkness before dawn over the shores of Normandy on D-Day began its journey to military fame as a DC-3 airliner, in use for commercial airlines that were making air travel – still new and novel – popular for the general public. It was the first aircraft to make transcontinental, worldwide commercial air travel possible. The first DC-type airplane was built by Douglas Aircraft Company for Trans World Airlines in 1933. It first flew in airline operation on December 17, 1935, eventually flown by 13 airlines in the US. The first DC-3 built was the Douglas Sleeper Transport — also known as Skysleepers by airline customers — and it was the height of luxury. Fourteen plush seats in four main compartments could be folded in pairs to form seven berths, while seven more folded down from the cabin ceiling. The plane could accommodate 14 overnight passengers or 28 for shorter daytime flights. The first was delivered to American Airlines in June 1936, followed two months later by the first standard 21-passenger DC-3. Like the civilian soldiers who sacrificed safety and comfort to answer the call to fight, when World War II came knocking on the door of the United States, this aircraft was transformed from civilian celebrity to military superhero. In 1941, a modified version of the DC-3 was chosen by the United States Army Air Forces (USAAF) as its standard transport aircraft. It could carry 6,000 pounds of cargo or 28 fully outfitted soldiers. If used for medical transport, it could hold up to 14 patient stretchers and three nurses. Although many different variations were made and used during World War II, the C-47 is most recognized because of its important role in the invasion of Normandy that would spark an end to the War in Europe. With the start of World War II, production switched to the C-47 for the duration of the War with 10,174 built for US operations. The planes were manufactured in factories in Santa Monica, CA, Long Beach, CA and Oklahoma City, OK. This famous airplane had seven basic versions that were built with at least 22 designations for the USAAF. The United States Navy version was known as the R4D, the Canadian a C-120, and to the British and Australians it was a Dakota. To many GI’s it was simply known as the Gooney Bird. C-47s carried cargo, flew passengers, dropped paratroopers, parachuted supplies, towed gliders and flew critical supplies over the Himalayas into China. In every theatre of World War II, the C-47 transported manpower and materials. During combat missions, C-47s would fly in “serials” of up to 50 planes, which delivered a defined package of men and materials to the target. Each plane had an assigned location in the formation and would get a chalk number written on the side to make loading simpler. When dropping paratroopers, C-47 squadrons would fly in a “Vs of Vs” formation. Each plane would fly in a three-ship V formation and each V would then fly in a nine-ship V. An eighteen-ship squadron would be two of these nine-ship Vs in trail. A tight formation was important to ensure that the troops landed as one unit in the drop zone. Towing gliders, the C-47s would fly in a column formation. Each tug would fly in a two-ship formation with the #2 plane echeloned to the right with the next two tugs behind. The formation consisted of two columns with 300 feet lateral separation between. Near the landing zone, the columns would separate 2,000 feet so that the glider landing patterns from the columns did not interfere. A truly remarkable feat! The C-47 was known to be one of the most vital pieces of equipment that helped win the War, remaining in service far after fighting ended in Europe and the Pacific. The aircraft is also acclaimed for its role in the Berlin Airlift (U.S. Navy Douglas R4D and U.S. Air Force C-47 aircraft unload at Tempelhof Airport during the Berlin Airlift) and the Korean and Vietnam conflicts." Your Chance To See the Aircraft Depart For Europe - From Oxford CT From the North American Continent, at least a dozen DC-3/C-47 aircraft will depart the U.S. on May 19th, after spending up to a week at Connecticut's Waterbury-Oxford Airport. Daily formation flight training activity, a Press Conference, and other activities are in the works. Mark down that week... May 12 - 19th. All material, logos and photos (except the B&W C-47 photo) are from D-Day Squadron Press Releases.